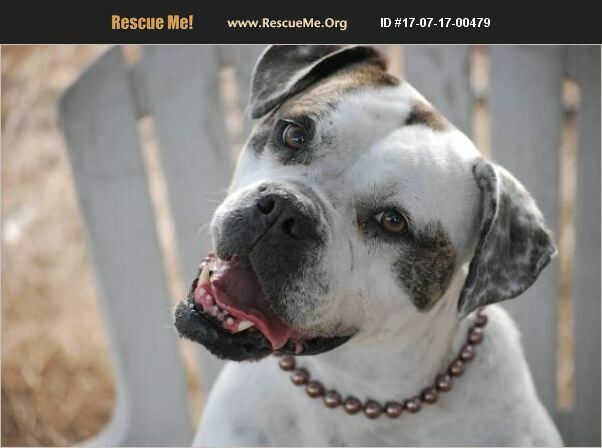 Molly is a very lovable, playful Bulldog/Boxer mix. We believe she was used for breeding purposes and then discarded. She has bonded with our little Jax who is also on Petfinder and we would like to adopt them together. They have been together for 3 years as each of them do not show well at events but are in fact angels at the rescue. Molly is affectionately known at the rescue as our Gentle Giant. Molly is not good with other dogs but LOVES Jax. We think she believes Jax is her baby! Molly needs a fenced yard and should not be taken out socially to parks etc. Jax is friendly but can jump very high and must be watched when outside in a fenced yard. The two of them are comical together and will be a lot of entertainment and love for someone. If you would like additional information on Molly, please email us at rufftimesrescueadoptions@gmail.com The POC for Molly is Paige. If you are interested in meeting Molly, please go to www.rufftimesrescue.org to fill out a pet of interest form. We will get in touch with you to set a good time for you to meet this lovable sweet girl!